A “self-help” talk show hosted by stand-up comedian and best-selling author Greg Behrendt. Most episodes are focused on relationship issues and features Behrendt attempting to improve his guests’ lives in some way — from cheating boyfriends to lifestyle makeovers. 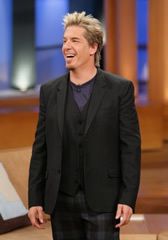 At the end of each episode, Behrendt hosts an “undercover” segment that touches on different subjects in humorous ways.